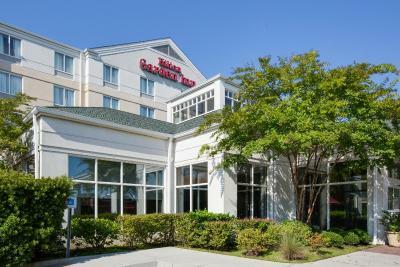 Lock in a great price for Hilton Garden Inn Charleston Airport - rated 8.8 by recent guests. Easy to reach location. Close to airport and freeways. The breakfast offered many choises, Quick check in and check out. WLAN worked quick in all areas of the hotel. The reception personnel was friendly. Breakfast was delicious! And the staff was helpful and nice. Very close to airport with excellent shuttle service. Within walking distance of local eateries. Convenient for airport and free shuttle. Restaurant food good standard for chain hotel. I liked the location for my purposes. The rooms were clean and spacious. The staff was friendly. Comfortable bed. Nice sized room. Courteous staff. Good breakfast. Great location. Enjoyed the walkway over to the PAC. There was a woman named Crystal that worked in the kitchen/bar area. She was friendly, helpful, kind, and one of the reasons we ate breakfast downstairs both mornings. People like Crystal are the reason you remember a hotel. The front staff was awesome!! Check in and out was an ease! The breakfast arrangements was by far the best! Charleston International Airport is 2 miles from this hotel, which offers free 24-hour shuttles to the airport and Charleston Area Convention Center. It provides a restaurant, indoor pool and rooms with free Wi-Fi. 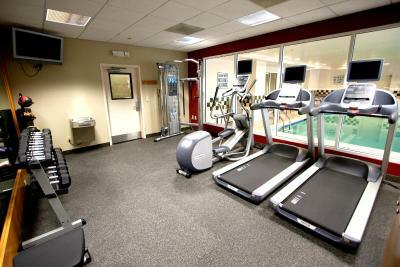 Guests can work out in the 24-hour fitness center, featuring cardio equipment with individual TV screens. Hilton Garden Inn Charleston Airport also offers a hot tub. A flat-screen cable TV with HBO and video games is offered in the contemporary rooms. A microwave, fridge and coffee maker are also included. The Great American Grill at Charleston Hilton Garden Inn serves breakfast. The 24-hour Pavilion Pantry Market offers freshly made salads and sandwiches, beer and wine. North Charleston Fire Museum is a 9-minute walk from the hotel. Magnolia Plantation & Gardens is a 17-minute drive away. Hilton Garden Inn Charleston Airport has been welcoming Booking.com guests since 3 Aug 2011. When would you like to stay at Hilton Garden Inn Charleston Airport? Includes a flat-screen TV, microwave and refrigerator. Suite features a separate living area with 2 32-inch flat-screen TVs. A door does not separate the rooms. This suite has a seating area, cable TV, and air conditioning. This accessible room has a seating area, cable TV, and air conditioning. House rules Hilton Garden Inn Charleston Airport takes special requests - add in the next step! Hilton Garden Inn Charleston Airport accepts these cards and reserves the right to temporarily hold an amount prior to arrival. Mold/mildew in shower and Bathroom! The price was too high and was raised because of a race. This takes advantage of customers. An elevator broke down so only one was operating and that was cramped. Not great service during breakfast. One elevator out of order. We were attending an event at the Coliseum so the boardwalk from the hotel was wonderful. We didn't have to worry about traffic or parking fee. Some of the boardwalk lights were out, though. The staff was exceptional and so accommodating! I will stay again. My biggest complaint is the bedding! The pillows were too soft and small. I traveled with my family for two nights and I had ask for extra towels because they only supply the room with a set of 3. My family was size 4. I booked the room prior to online with who's traveling with me. When they came in to refresh the room they took the extra towels I requested and left us with 3 towels again. I had to call front desk. Just a minor set back. Very clean, best linens ever!! Lots of pillows. I was selected to be the "Guest of the Day" and was presented with an envelope with a very nice letter thanking me for choosing this Hilton Garden Hotel and to remind me if i needed any thing at all, to let them know. There was also a coupon for a complimentary cocktail at the bar. We went downstairs to get a drink and stayed for a delicious dinner. The atmosphere was casual and relaxing with well appointed surroundings. It was a pleasure to stay there. One person in my party had an early flight but the shuttle is available 24 hours so they picked her up at 5 AM. no mini-bar; one wastebasket in living space, one more by coffee maker would be nice. Place is run down . Second Hilton property that had mold . Not sure why they aren’t working on that problem .